This year is a major election year. Not only will we be voting for the President, but our Township Board and Parks and Recreation Commission positions will be on the ballot. As you may recall, the primary election will take place on August 2, 2016. The general election will be November 8, 2016. Please put these dates on your calendar. Six of the current members of the Oakland Township Board of Trustees have announced their candidacies for the November 2016 election. Mike Bailey, trustee, is running for Township Supervisor. Mr Bailey has been a trustee since 2008 and previously served 20 years on the Planning Commission, the last several years as its chairman. Township Clerk Karen Reilly is running for re-election. She is currently serving her first 4-year term as Clerk. Township Treasurer Jeanne Langlois is running for re-election. She is currently serving her first 4-year term as Treasurer. She is also a member of the township Safety Paths and Trails Committee. Robin Buxar, trustee, is running for re-election. She was appointed to the township board in November 2013 and elected to the position in 2014. John Giannangeli, trustee, is running for re-election. He was appointed to the township board in April 2014 and elected to the position in 2014. He also serves on the township Planning Commission (since October 2013) and previously served on the Zoning Board of Appeals and the Board of Review. Frank Ferriolo, trustee, is running for trustee. He was appointed to the township board in May 2015. He also serves as a member of the Paint Creek Trailways Commission. It should be noted that current Trustee Mike Bailey has decided to run for Supervisor. The campaign season has begun, and this website will provide information on the candidates as information becomes available. We hope that it will help our citizens make informed decisions in August and November. Any editorial comments will be noted as such. Why is this important to the citizens of Oakland Township? The primary election is usually the more important election for the local positions since that is when the political parties nominate their candidates. Since our community usually elects the Republican candidates in the general election, the election in August will most likely determine who will sit on our Township Board and Parks Commission. Please make sure you vote on August 2nd. This entry was posted in Board of Trustees and tagged Board of Trustees, Frank Ferriolo, Jeanne Langlois, John Giannangeli, Karen Reilly, Mike Bailey, oakland township, Oakland Township Board, Robin Buxar on February 29, 2016 by richardjmichalski. Is Detroit Water still an option for parts of Oakland Township? 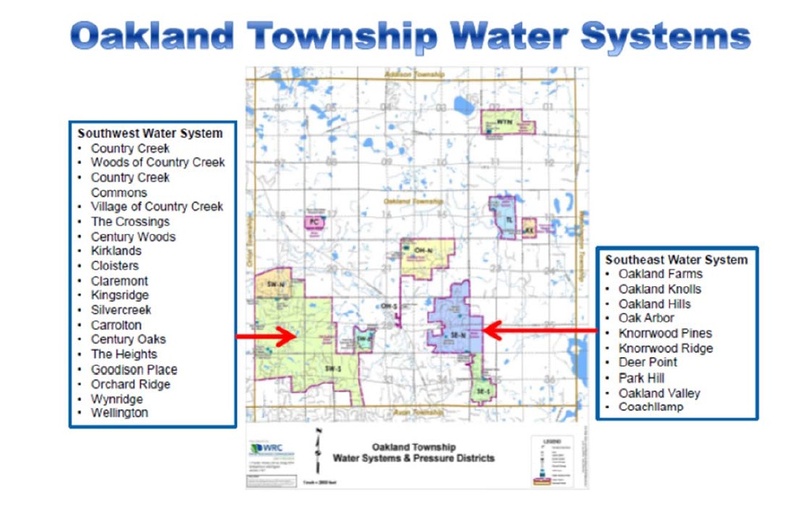 At the May 26, 2015 Oakland Township Board meeting, Supervisor Gonser announced that he planned two public meetings for citizens impacted by the water supply systems that are being considered for two sections in Oakland Township. One section is in the Southwest portion of the Township, and the other is in the Southeast portion of the Township. Gonser announced the meetings would occur on June 18, 2015. Treasurer Langlois thought the meetings were premature, and was opposed to having the meetings. Trustee Giannangeli indicated that Detroit Water is still under consideration by the Township. This option could result in water tap fees for the impacted citizens. It was recently posted on the Township website that the meetings have been postponed. Oakland Hunt would not be a subdivision included in the Southeast water district. Gonser went on to say that there are two aspects to the water supply system issue. Engineering issues are one. He wanted to present this information at the June 18th meeting. The other aspect is the legal, or operational, issues associated with the systems. contract with an outside company to have them maintain and operate the system. Trustee Giannangeli also commented that Detroit City Water is still an option. Treasurer Langlois commented that the June 18th meeting was premature since she felt the legal/operational matters needed to be understood before going back to the citizens. After the May 26th meeting, the Township website posted that Gonser’s announced June 18th meetings have been postponed. Here are previously reported posts related to this topic. Why is this important to the citizens of Oakland Township? Trustee Giannangeli’s comment raises an issue regarding potential costs to the residents impacted in the two water district sections of the Township. The Board had previously decided that Oakland Township would not use Detroit Water, and as a result refunded several million dollars in water tap fees to (primarily) developers who paid for future connects to the Detroit water system. Since that money was returned to (primarily) developers, if the Township now decides to have Detroit water, the private homeowners impacted may have to pay a water tap fee. Some of those homeowners may have understood that any future water tap fee to the Detroit system was already included in the purchase price of their home. They may now be faced with paying for it a second time. It appears Treasurer Langlois, who is a member of the water system subcommittee (along with Giannangeli and Gonser), was surprised that the June 18th meeting was being announced. Gonser’s decision to announce the meeting is yet another example of him overstepping his authority and making a decision without subcommittee and Board approval. This entry was posted in Legal Problems, Supervisor Gonser and tagged Gonser, Jeanne Langlois, John Giannangeli, oakland township, Oakland Township Water supply, Supervisor Gonser, Supervisor Terry Gonser, Terry Gonser on June 1, 2015 by richardjmichalski. During the commissioner comments portion of the October 7, 2014 Oakland Township Planning Commission meeting, Chairman James Carter confronted John Giannangeli for calling James a liar at the September 9 Planning Commission meeting. The video recordings of the comments made at the September 9th Planning Commission meeting and August 12 Board meeting clearly indicated that John Giannangeli was the one who lied. James graciously accepted his apology and indicated he would never bring it up again. Why is this important to the citizens of Oakland Township? John Giannangeli’s character clearly comes into question when he accuses someone of lying, when he was the one who had lied. John was nominated by Terry Gonser to fill the vacant Trustee seat when Sharon McKay quit the Board. A previous example of John’s ‘volatility’ was previously reported on this website. In the November 4th election, John is on the ballot to officially fill McKay’s seat. There are three people on the ballot to fill two seats (Robin Buxar is also on the ballot to fill Judy Keyes’ seat). I would recommend the voter’s send John a message by not voting for him. I am not endorsing the third candidate. The ballot instructions says “Vote for not more than two”. If you find John’s actions inappropriate, I recommend you vote for only one, Robin Buxar, to send John a message. This entry was posted in Ethics and tagged John Giannangeli, Planning and Zoning in Oakland Township, Unprofessional behavior on October 10, 2014 by richardjmichalski. At the September 9, 2014 Board meeting, Trustee Buxar commented on how there have been comments made by Board members at other Township meetings implying that Board conversations occurred when those conversations had not occurred. She went on to say that conversations may have occurred between other Board members, but did not include her. She asked that these statements be stopped in the future. Trustee Thalmann responded in a manner that had nothing to do with the issue that Trustee Buxar brought up. In fact, she took the opportunity to attempt to ‘pat herself on the back’. Although not captured on video (I was present at the meeting), the expressions on Trustee Giannangeli’s face when Buxar was making her comments were ones of bewilderment. The statement that Buxar made was in response to Trustee Giannangeli’s comments at the September 2 Planning Commission meeting. As reported previously, Trustee Giannangeli made comments regarding the Board’s request for an RFP for the Planning Consulting services BEFORE any such discussion occurred with the entire Board in an open session. Another Open Meeting violation by Oakland Township Board or Gonser’s ‘puppet’ speaking? Why is this important to the citizens of Oakland Township? This is yet another example of how several members of the Board fail to recognize their mistakes, and learn from them. The self rationalization of their actions apparently give them a sense of infallibility that this Township can ill afford. This entry was posted in A new kind of "Transparency" and tagged John Giannangeli, Maureen Thalmann, Oakland Township Board, Transparency, Trustee Thalmann on September 21, 2014 by richardjmichalski. The Township Board approved spending $40,000 of funds from the ‘general fund’ to improve the gravel road portion of Silverbell Road at the September 9, 2014 Board meeting. The Board approved spending this money by a 4 to 3 margin. the precedent setting action of the Township assuming responsibility for the safety of the roads. The Oakland County Road Commission has that responsibility. This decision may cost the Township ‘dearly’ in the future. At the September 9, 2014 Oakland Township Board meeting, Supervisor Gonser stated that the Road Commission had contracted for enough limestone to improve about one additional mile of gravel roads in Oakland Township. This limestone was in addition to the improvements that occurred on Dutton Road this year. Road improvements in our Township (above and beyond what is required for safety) have historically been covered by what is called tri-party funds. The dollars for these improvements come from three sources, 1/3 from the Road Commission, 1/3 from the County and 1/3 from Oakland Township (hence the name tri-party fund). In other words, our dollars are ‘leveraged’. The cost for the Dutton Road improvements was also shared between Oakland Township and Rochester Hills. That improvement was totally covered by tri-party funds from both communities. The cost for the additional mile of limestone could not be totally covered by the remaining 2014 Oakland Township tri-party funds. It would require an additional $40,000 from Oakland Township’s ‘General Fund’. Supervisor Gonser wanted to authorize the Road Commission to purchase and use the limestone on Silverbell road in response to safety concerns raised by citizens. Treasurer Langlois indicated she was not in favor of using Township ‘General Funds’ to improve road safety when road safety was the responsibility of the Road Commission. She also pointed out that the Township’s road improvement planning has deteriorated since we lost our previous Township manager. Treasurer Langlois, Trustees Buxar and Bailey all expressed disappointment that a more comprehensive plan had not been developed that would ensure the most critical roads in the Township were being addressed. The Township Board voted on the motion to purchase the limestone, and it passed with Gonser, Reilly, Thalmann and Giannangeli supporting the motion. Langlois, Buxar and Bailey being the dissenting minority. Why is this important to the citizens of Oakland Township? The use of general funds for road improvements to eliminate safety concerns could be a precedent setting action. The Road Commission may now look to the Township to pay for future road improvements that they consider safety related. Until now, the Road Commission has been responsible for safety. The Board’s decision may cloud that responsibility going forward. If the Township becomes responsible for road safety, our taxes will certainly increase to cover those costs. The politically expeditious decision by Supervisor Gonser, Clerk Reilly and Trustees Thalmann and Giannangeli may cost the Township dearly in the future! This entry was posted in Ann Capela, Board split?, Supervisor Gonser and tagged Ann Capela, Board of Trustees, Clerk Karen Reilly, Jeanne Langlois, John Giannangeli, Misuse of funds, oakland township, Oakland Township Board, Oakland Township Board split, Trustee Thalmann on September 17, 2014 by richardjmichalski. The August 12 Oakland Township Board meeting had an agenda item to discuss a Request for Proposal (RFP) for planning services. Due to the length of that meeting, that agenda item was never discussed. It was tabled until the September meeting. The Supervisor never requested any input on this topic from the Planning Commission, even though they could be significantly impacted by the Board’s decision. At the September 2, 2014 Planning Commission meeting, Trustee Giannangeli failed to bring up this issue for discussion. However, Chairman James Carter added it to the agenda based on a request from another Board member. During the discussion, Giannangeli indicated that the Township Board wanted to send out a Request for Proposal (RFP) for the Planning Consultant services in Oakland Township. He went on to say that they may want two RFP’S. One for the Planning consulting services for developing the Master Plan, and yet another one for the ongoing Planning Commission support services. This topic had never been discussed in an Open Meeting with the Township Board, yet Giannangeli presented it as a request from the Board. Where is Trustee Giannangeli getting this direction? If it is coming from the Board, it is a violation of the Open Meetings Act since it was not discussed in an open meeting. If it is coming from Supervisor Gonser, then Gonser is usurping the authority of the entire Board. In either case, John Giannangeli’s comments were inappropriate. Why is this important to the citizens of Oakland Township? If the direction Giannangeli said DID come from the Township Board, it was a clear violation of the Open Meetings Act. If the direction Giannangeli stated as coming from the Board really was just a conversation Giannangeli and Gonser had, it is an example of how Gonser is using Giannangeli as his ‘puppet’ on the Planning Commission. This is not the first time Gonser has attempted to influence the Planning Commission by having personal conversations with his ‘appointees’. It was previously reported on this website how Gonser used Ron Hein, another one of his appointments, to influence the strategic direction of the Planning Commission. As Gonser continues to ‘purge’ the various board, commission, consultant members in Oakland Township, history has already demonstrated that his replacements look to Gonser for ‘direction’. Is that the type of leadership and community the citizens of Oakland Township want? This entry was posted in A new kind of "Transparency", Board of Trustees and tagged Abuse of Power, Board of Trustees, Dictatorship, Gonser, John Giannangeli, oakland township, Oakland Township Board, Oakland Township Ethics, Open meeting act violation, Open meetings Act, Supervisor Gonser, Supervisor Terry Gonser, Terry Gonser, Transparency on September 10, 2014 by richardjmichalski.